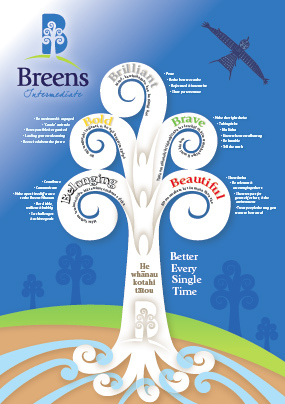 The schools that we were privileged to visit were Breens Intermediate and Te Pa o Rakaihautu. There were 2 really key points that I took from these visits: 1) seeing what it looks like when a shared vision is in action and 2) what MLE can look like in traditional classrooms. What they showed together was that modern learning environments is a complete misnomer, it is about modern learning practices. The Principal Brian Price spoke to us about having 5 rules only at their school. The 5 B’s – Brilliant, Bold, Brave, Belonging and Beautiful – apply to both students and staff. Students in the school proudly showed us which value badges they had achieved so far, class expectations were framed in regards to these and students (both Year 7 and 8) could explain to us clearly how (and why) they needed to act according with these values – without us even mentioning the words to them. For staff, they have aligned these values with Hermann’s Brain and look to create teams of 3 based upon this. The Hapu of 3 teachers negotiate amongst themselves for who is taking care of which role: Belonging & Beautiful – the red brain relational person; Bold and Brave – the green and blue organiser; Brilliant – the yellow brain in charge of developing rich, responsive curriculum. Acknowledging that people move within these, it gives each team a way to organise their operation. It is also in their best interest to get these roles right together as they are appraised as a team. Only in their 4th week of operation, we were greeted by the whole school (about 120 students in Years 1-10) in a powhiri. All students were then lined up for us to Hongi and it was clear that they are trying to develop a school-wide character of manaakitanga (last 3 links included for any overseas readers who are unfamiliar with these Maori words). 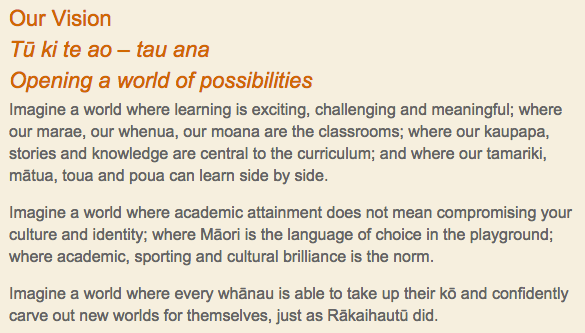 Many schools speak about being like a family – Te Pa o Rakaihautu is truly living this. The whole school eat morning tea, lunch and afternoon tea together which is provided onsite. This costs per week with lower per head cost when you have more children in the school. For those families who struggle financially, they run a system where others in the community can help pay for children so all can eat together. The lunch area was not segregated by age and each table had students of all ages eating together – teenagers happily sitting with 5 or 6 year olds. In sitting down with school leaders to eat some of the (massive) spread of food offered to us, it was incredible hearing of how much food is gifted to the school from the community – 2 hams dropped off the week previous, while that morning 20 watermelons had been delivered by 1 family. A range of ages playing together at lunch quickly ended when the conch shell blew to draw students back to class. Both schools were developing strong relationships with their students which enables positive learning experiences to be built that will challenge each student individually. Through very different means, both schools illustrated that it is not just purpose built facilities that can take on ideas of modern learning environments. In fact, it is through schools and teachers like these that we can all see the better term is not modern learning environment but modern learning practices. The school has been split into 3 hapu of 90 students with 3 teachers as explained above (plus some teacher aide hours as well). This allows teachers to develop strong relationships with their students. At the start of the year they operate as normal classes setting up the year. When we visited last week, 1 hapu had moved into their structure for the rest of the year and the other 2 hapu were making the shift once their classes were ready. This involved the classes changing from how you would see them in most other schools. Now the classes in the block have shifted from traditional spaces to one room being the mountain top room, one being for group work (campfires), one being for 2 teachers teaching skills to students in groups of 10-12 and a cave room for silent individual work. Each of these spaces had signs saying what that space was for and how students should be acting in there. The teacher aides were mainly based in the group work room and 1 teacher was roaming giving assistance. Students were calmly moving between spaces based upon their current learning need. 11 and 12 year olds could explain why they needed a cave space at that time or why they had booked in a workshop with a teacher. It was great seeing this in place and students really understanding their learning needs. 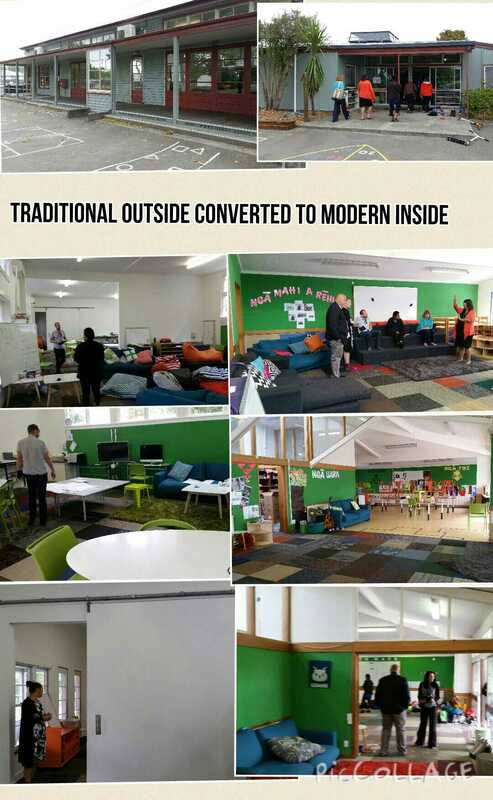 On the other hand, Te Pa o Rakaihautu was a great example of how schools can change traditional environments to create modern learning spaces. Te Pa o Rakaihautu are currently in the old Richmond School buildings. At the end of this term they move to Linwood Intermediate’s buildings while their new premises are designed and constructed. They have not just made do for this term though. They have shown that they want their students to have pride in their facilities and opportunities. The old buildings have been converted to modern spaces with low amounts of $ spent. Walls have been knocked down and doors removed to open up spaces. The sliding door on the bottom left of the image used to be in the hall so has been repurposed to create a flexible break out space. The furniture was sourced from trademe or 2nd hand stores rather than brand new through educational furniture companies. Old timber and carpet was made into new tiered seating and sound absorbing walls created using old crate materials with carpet. Their aim was to create environments to support their vision of their learning. It worked, we were all completely surprised at the transformation from outside of the buildings to inside. We were unable to see the classes in action as we arrived before lunch but I had conversations with staff about their first iterations at connecting learning areas for their Year 7-10 students. Just the fact that they are talking about the prototype efforts of learning shows that they are pushing themselves to improve their practices. As they grow over the next few years to include Senior classes at the same rate that we will at HPSS I certainly hope that we will find ways to connect and support each other. At Hobsonville Point Secondary School we have been blessed with an impressive brand new building. I often feel frustrated though when visitors walk around looking up at the building. Our strengths so far are the powerful partnerships that provide a platform for personalised learning to occur. I would hope that visitors to HPSS would see this rather than just the building. Breens Intermediate and Te Pa o Rakaihautu are living proof that the buildings are no barrier to modern learning practices. If we are showing a shared vision and iterating modern practices at HPSS as strongly as Breens and Te Pa do, then I am a very happy teacher! This entry was posted in Uncategorized and tagged #efellows15, Breens Intermediate, Christchurch, efellowship, Hobsonville Point Secondary School, mle, mlp, Modern learning environment, modern learning practices, school, Te Pa o Rakaihautu by stevemouldey. Bookmark the permalink. Ngā mihi nui ki a koe Steve. A beautifully written insight into two of Christchurch’s inspiring kura. Thanks for your reflection and for seeing the wairua and vision of these two amazing schools.